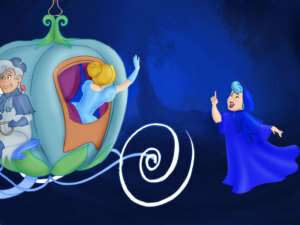 Once upon a time there was a kind and beautiful girl, whose name was Cinderella. 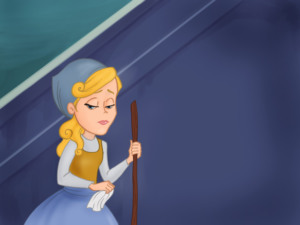 She lived with her cruel stepmother and stepsisters where she was treated as a servant and spent her days cleaning, tidying and waiting on them hand and foot. 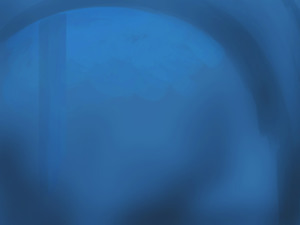 One day an invitation to a royal ball arrived. The Prince was looking for a bride and everyone in the kingdom was invited. Her stepmother immediately ordered new gowns to be made for herself and her daughters. 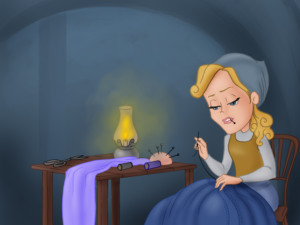 Cinderella worked day and night to prepare the new dresses in time. 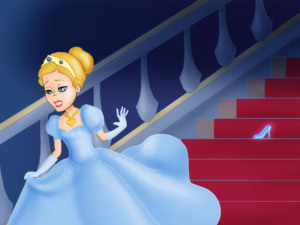 On the day of the ball, as they were preparing to leave, Cinderella came down the stairs in a dress she had made for herself. 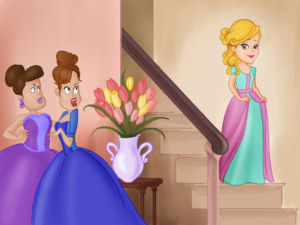 Her stepmother and stepsisters were so angry to see her looking so beautiful they tore up the dress and left without her. 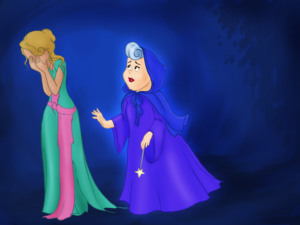 Left alone, Cinderella began to cry when all of a sudden her Fairy Godmother appeared. “Do not cry my child, you shall go to the ball!” she said. 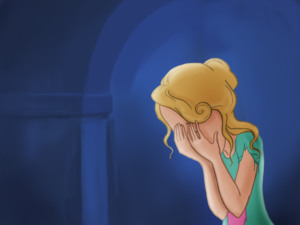 “But I do not have a dress to wear.” cried Cinderella. 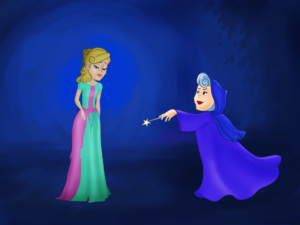 Her Fairy Godmother waved her magic wand and at once Cinderella’s rags turned into a beautiful new ball gown. 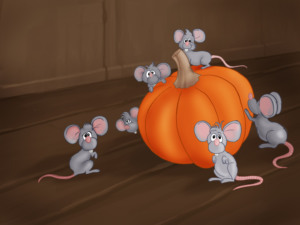 Then her Fairy Godmother found six mice playing in the pumpkin patch. 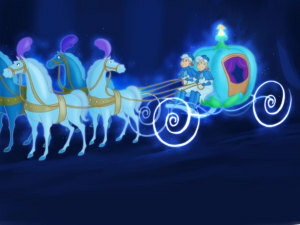 She touched them with her magic wand and the pumpkin turned into a beautiful coach and the mice into four white horses and two coachmen. 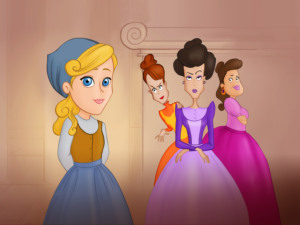 When she entered the ballroom, the guests were struck by her beauty and her stepmother and stepsisters did not know who she was. 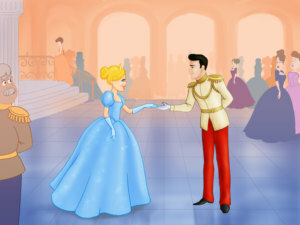 The prince asked Cinderella to dance and she was overjoyed. 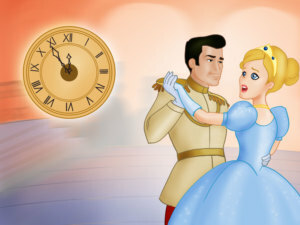 The Prince and Cinderella danced all evening until Cinderella noticed the clock approaching midnight and she remembered her godmother’s words. 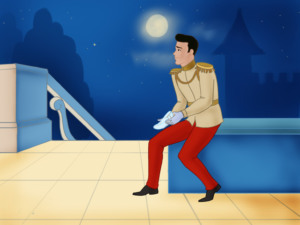 “I must go” she told the Prince as she fled from the ballroom. 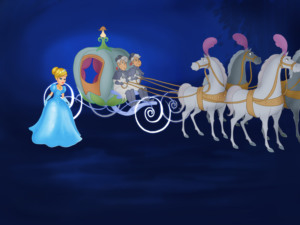 As she ran down the steps of the palace, one of her glass slippers fell off, but Cinderella did not stop to pick it up. 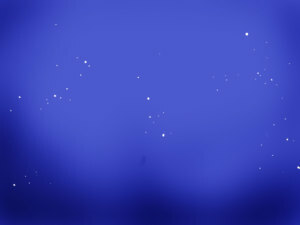 She returned home just as the clock struck twelve. 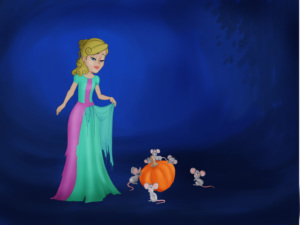 Her coach turned back into a pumpkin, her horses became mice and she was wearing rags once more. Her stepmother and stepsisters arrived home shortly afterwards and were full of talk of the beautiful girl who had danced all night with the prince. 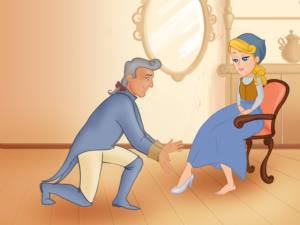 The prince and his servants took the glass slipper to every house in the Kingdom, but it did not fit any of the women who tried it on. 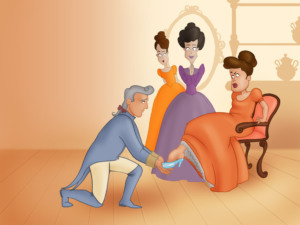 Cinderella’s stepsisters tried to squeeze their large feet into the dainty shoe, but the servant was afraid it might break. 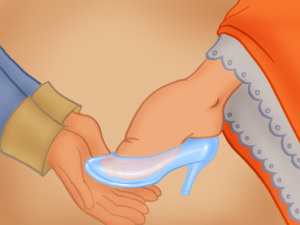 Cinderella’s stepmother would not let her try on the slipper, but the prince said “Wait! Let her try it!”. The slipper fit Cinderella’s foot perfectly and the Prince realised this was the beautiful girl he had danced with at the ball. The Prince had found the girl he was looking for. They were married and both lived happily ever after.